Freddy the Frogcaster is tracking the weather at Frog News Network when he realizes a huge hurricane is coming! Can the town of Lilypad prepare for the storm in time? Can Freddy report the weather on TV and make sure his family and friends are safe? 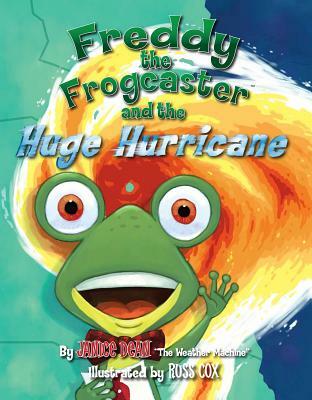 Fox News Meteorologist Janice Dean "The Weather Machine" continues her beloved Freddy the Frogcaster series in this whirlwind adventure that will leave readers with lasting real-life advice on how to prepare for hurricane season. Janice Dean is the senior meteorologist for the Fox News Channel and Fox Business Network. Dean joined FNC in January of 2004, reporting on some of the biggest weather stories in history such as Hurricane Katrina, and more recently, the Moore and El Reno 2013 tornadoes in Oklahoma. She also led the coverage on FNC of Hurricane Sandy in 2012. Janice is a member of the American Meteorological Society and was awarded the AMS Seal of Approval in 2009. Many viewers know Janice as "Janice Dean the Weather Machine," a nickname that was given to her by Fox News Anchor Shepard Smith when he introduced her on his show Studio B.
Janice resides in New York with her husband and two sons.